Have you ever taken a shower in a new place only to find the water pressure is so low you can barely feel the water? There is nothing more frustrating than a weak shower. There are many shower heads available designed to increase water pressure in lower pressure conditions. 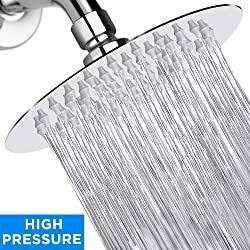 What is the best high pressure shower head available? The high pressure shower head market is very competitive. 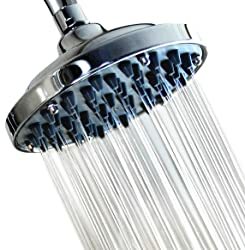 You can find a large-sized rainfall-type high pressure shower head for under $30. You can also find some higher end products with more features for over $100. We have reviewed some of our favorite products and want to share our findings. WASSA makes this shower head out of ABS materials with brass connections to make it lightweight and durable. The shower head has 45 silicone jets that are self-cleaning to help prevent lime buildup. This shower head is easy to install and fits any standard shower arm. It has a stainless steel filter to trap any sediment and hard water deposits. It only has one water spray setting and is 3-inches wide. WASSA offers a lifetime guarantee on this product and you can stand by their slogan which is “buy with confidence”. This is a handheld shower head that delivers high pressure water flow even in low pressure water systems. It has silicone rubber jet nozzles that prevent the buildup of lime and other minerals. YOO.MEE makes this shower head out of durable ABS plastic. The stainless steel hose is 79-inches long and delivers great water flow despite the long hose. The water flow rating of this product is 2.5 GPM. It has three different water spray settings giving you flexibility and options while taking your shower. YOO.MEE offers a 1-year warranty on this product. 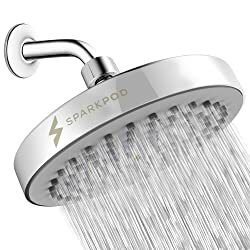 If you are looking for a shower head replacement, consider the Spark Pod high pressure rainfall shower head. It is a perfect replacement that will give you high pressure water flow even in low water pressure conditions. 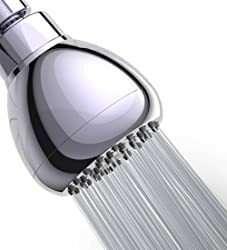 This shower head will easily connect to any standard shower arm allowing you to use it within minutes of installation. The shower head comes with 90 anti-clogging silicone nozzles to help remove lime and other mineral deposits. The water restrictor is easy to remove if you need to add additional pressure for your water system. Spark Pod offers a 1-year free replacement warranty on this product. This shower head has 42 nozzles that deliver strong water pressure and water flow rate. In order to get the high pressure water flow in a low pressure system, you will have to remove the flow limiter. Aqua Elegante designed this shower head using ABS plastic material and solid brass fittings. Self-cleaning nozzles prevent lime and mineral buildup. You can use this shower head outdoors, in your home or even in an RV. Installation is simple by just twisting the new shower head onto your existing shower arm. This shower head has a water flow rate of 2.5 GPM. The shiny chrome finish and gray nozzles will blend in with any bathroom decor. Aqua Elegante offers a 5-year warranty on this product making it risk-free to try. This shower head uses the patented Anystream 360-degree technology. This allows you to switch between water spray settings and still get even water coverage. Six patented plungers in the shower head allow pressure to build before leaving the nozzles creating a high pressure water flow in low pressure conditions. There are 48 sprays that you can adjust by rotating a lever on the side of the shower head in either direction. 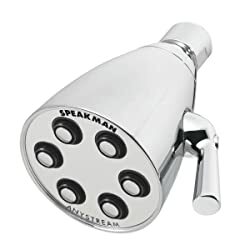 Speakman makes this shower head out of solid brass for durable construction. The polished chrome finish is corrosion-resistant and will keep its sleek appearance for a long time. Speakman provides a lifetime limited warranty on this product. The solid brass construction and a lifetime warranty make this shower head one to consider. 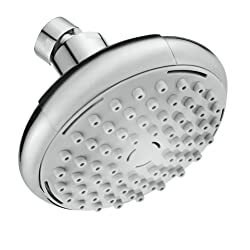 This product features a 4.2-inch wide gray shower head with self-cleaning silicon nozzles. It uses patented Air-Power technology to produce air-injection in the shower head nozzles to give you more powerful water flow from the shower head. The manufacturer designed it for high performance under low water pressure conditions. This shower head is quick to install by hand and is engineered with heavy-duty ABS plastic. KZKJ offers a 10-year limited warranty on their product which makes this a risk-free choice for your bathroom. This NearMoon shower head is stylish with an ultra-slim 0.08-inch stainless steel face. They use a combination of ultra-thin design and air-in technology to achieve a strong high water pressure flow. This works well even in low pressure water systems. The boost in water pressure will amaze you after using this shower head. 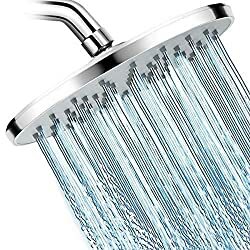 NearMoon makes this shower head of 100% stainless steel which is rust-resistant and durable giving you a shower head that will last a long time. There are 60 silicone self-cleaning nozzles that prevent any hard water or mineral buildup. The sleek appearance of this shower head makes this a perfect match for any bathroom decor. If you are remodeling an existing bathroom or building a new one, this shower head is easy to install and requires no tools. NearMoon offers a 2-year product warranty making this a great selection for your bathroom. This 9-inch wide shower head from WarmSpray gives you great water flow in high pressure or low pressure water systems. There are 80 anti-clogging nozzles on this shower head which help prevent lime and hard water deposits from forming. You can adjust the shower head angle as needed to meet your needs. WarmSpray makes this product out of premium quality ABS (acrylonitrile butadiene styrene) plastic. It is rust-resistant, corrosion-resistant and the plastic material keeps the shower head lightweight and easy to maneuver. This product comes with a limited lifetime warranty which makes it a risk-free choice for you to consider. This shower head offers you a consistent high pressure water spray even in low pressure water systems. The 6-inch diameter shower head has a total of 57 jets to help provide wide water coverage. You can remove the water flow regulator if you need to get even stronger water pressure. The design of this shower head allows you to detach the nozzles from the base for cleaning and to remove any debris or buildup. 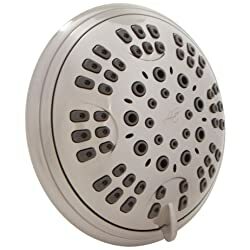 This shower head gives you 2.5 GPM (gallons per minute) of water flow and fits any standard U.S. plumbing connections. This shower head is ideal for any homes that have low water pressure. You can choose from one of six different water spray settings when you use this brushed nickel shower head. This brings the spa experience right to your own bathroom. The design of this shower head makes it perfect for low water pressure homes. You can remove the low flow limiter in the shower head to increase the water flow rate. This will give you even more water pressure to enhance that spa-like experience even more. The self-cleaning nozzles prevent natural calcium and lime buildup. This shower head is easy to install and requires no tools. Aqua Elegante offers a 5-year warranty on this product with no questions asked. This is a risk-free choice for a high pressure water boosting shower! If you live in an older home or apartment complex, then you are familiar with the difficulties of low pressure water systems. We want to shares some guidelines with you on the types of features to consider before you buy a high pressure shower head. Many shower heads on the market have water flow regulators intended to save and conserve water. These types of shower heads are typically referred to as high pressure shower heads. To increase water pressure, the jets in a shower head use air-injection and other technologies to produce a more powerful water flow. This may not be enough, however, if your home has lower water pressure conditions. Before selecting a high pressure shower head, be sure it has a removable water flow regulator. You may need to remove this small part if you expect to get any high water flow out of your low water pressure system. The size of the shower head can make a difference in your water flow. 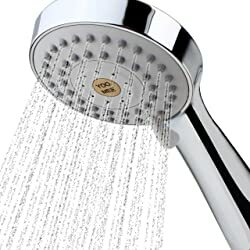 If you have a low pressure water system consider a high pressure shower head that has a small diameter face. such as 3-inches This will make sure that the water flow from the shower head is more concentrated than with a larger diameter face. Many of the shower heads available are made of ABS plastic. This keeps the shower head lightweight, but it may not be as durable over a long period of time. 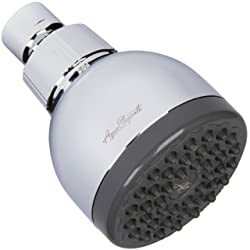 If you are looking for a high pressure shower head, consider one that is made of all metal such as stainless steel or brass with a polished finish. Products made of metal tend to last longer and are more durable. There are many options available for a high pressure shower head. If you have a home with low water pressure, and the water flow out of your shower is a trickle of water, you should consider a new shower head.